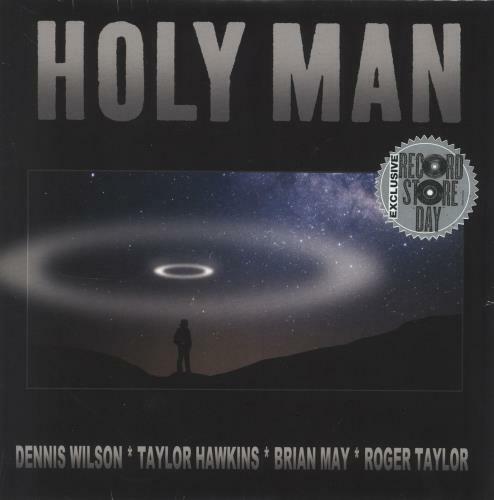 WILSON / HAWKINS / MAY / TAYLOR Holy Man (2019 UK limited edition 7" vinyl single released exclusively for Record Store Day - Dennis Wilson wrote and recorded Holy Man in 1977 during the sessions for his legendary Pacific Ocean Blue, the sole album released by The Beach Boys' co-founder during his lifetime. In 2009, Taylor Hawkins of the Foo Fighters added vocals to the long-unfinished track; 10 years later, 'Holy Man' receives new life with additional instrumental backing from guitarist Brian May and drummer Roger Taylor. Accompanied by the original instrumental version, the vinyl is BRAND NEW & UNPLAYED housed in the picture sleeve which remains sealed within its custom-stickered shrinkwrap).